For there to be 2 TM211 modes that close means the dielectric is splitting the mode. 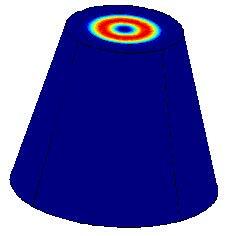 I would guess the higher frequency is from the dielectric surface and the lower from the end wall (but including the dielectric) but the COMSOL diagram would appear to me to be of the higher frequency mode ? The Majorana fermion may have been finally found, after 77 years ! AIUI, I believe they've found something that operates on the same principles as the Majorana fermion, but it's a combination of an electron and a hole, not a particle and an antiparticle. Figure 22 on page 18 worries me. That upward slope over 30 seconds while the rf was on and a slow fade after rf was off says heat was the cause. 70uN thrust/60uN heat. Yes, that's the coupling between the magnetic damping and the field from the power cable I have been writing about. Notice that the coupling is HUGE. By their own admission the "null" signal is 25% of the good signal !!!!! Having said that, my Mathematica analysis of the coupled nonlinear differential equations of the inverted pendulum is showing that the NASA Eagleworks results may be due to real thrust. However without knowing the actual magnitude of the magnetic damping I am unclear at this point whether and how much is the distortion from the test and how much is real. The big unknown I have is the magnitude of the magnetic damping. Unfortunately Paul March has stopped communication some time ago. If he could provide the C value for the magnetic damping, it would be very helpful. I would even perhaps be able to confirm that the NASA Eaglewoks results are real. Yeah all the modes show some heat or something else too. Yes, but it looks like there is something real exciting the system. The only argument I see now for an artifact would be that the magnetic damping is interacting with the power cable AND the dielectric effect. Because they measure no thrust without the dielectric. And because flipping the orientation of the dielectric flips the direction of the thrust. So if it is an artifact one would have to explain it as a result of the magnetic fields (from the damping and the power cable) interacting with the dielectric. Gravity is a how not a why. Two points for Gryffindor on that one. Still, isn't it a property of matter? If it should be a property, then the question is, how does it work. If not a property, then I don't know the question to ask. If we knew how gravity really worked, we'd all have hovercars. I just want my darn hovercar and hoverboard already. We have 1 year left! I marked up the Nasa paper with a line showing where to lop off the bell pillbox because it makes no difference. Then what's the function of the "pillbox" after all? It would seem that the very geometry of the apparatus is not conducive to maximizing the anomalous thrust. I think both the cannae and tapered cavity were derived by inventors who had no idea how it worked, just that it worked. The pillbox and the slots are evidence of that. It doesn't matter how it works to crank out a cool gizmo that does neat stuff that makes people like us write 100 page forums. It takes knowing why to optimize it and make it take us to the stars. Unless we brute force it with high power/energy/superconductors and have it work but work like s#@t.
Maybe we'd be better off using sound instead of rf and use a sound room to create boundaries. I'd like you to expand on that idea a little bit. Sound is at least metaphysically fundamental on one level, and physically all around us on another. Plus, it can be used to levitate or manipulate objects in certain environments. One question I would ask, is, at what frequency does sound no longer exist? Both high end and low end. I picture sound just like any other particle/wave situation. It is much easier to work with too. Sound recently has been show to have particle behaviors. Phonons. Could there be a neat casimir effect too when in a sound proof room? Probably not, just thinking of impossible stuff. Silly question and may sound of topic but I assure you it is relevant. Are causality and information conjugate variable pairs? There is some kind of connection between information and causality. This is my intuition. The obvious, extreme interpretation of that connection, from a pragmatic standpoint, should it be confirmed, would be teleportation. I agree. Seriously, and AND logic gate is a transducer from information to heat. And no I don't mean like how a computer heats up, that happens too but that isn't where I'm going. That is the most exciting thing I have ever read. It is backed up by conservation of information in black holes too! The internet isn't helping me much. This problem is related to a whole other nother obsession I had since I learned about "A new kind of Science" where I was trying to make sense of information and computation giving rise to the universe. The problem that I had with Wolfram's book is that he has to assume that there is a preexisting "matrix", and that there has to be sufficient time for his single celled spreadsheet (Or whatever it's called) to create a universe. It's a Godelian problem, I'd say. That was my takehome from the book. As an aside, a related problem, in my mind, would be the apparent irreducible complexity of the DNA molecule. One faction insists on the faith that random matter, immediately upon it's creation at the big bang, embarks on evolution, which can only and inevitably, in the one universe that we witness, results in DNA and intelligent life. This, despite there being no possible mechanism nor sufficient time to so evolve from randomness. Neat, wish I understood that. I really am very interested in genetics, but not the beauty of the double helix. I should be. ...why emdrive might have produced a small force really boils down the one fundamental problem, ... the problem being the origin of inertial mass. What I bin sayin'. Start with Sciama '53. I've been trying to break Sciama all day and I'm not smart enough. I'll keep an edit on this thing til we have it nailed down. Thank you. What I bin askin' for. At about 1Gev/cm^3 (as seen on this seemingly optimistic paper, maybe more optimistic is possible) and .01m² csection and 250km/s dark flow velocity that is mflow=1e9*1.8e-36/1e-6 * 2.5e5 * 1e-2 = 4.5e-18 kg/s. Pow = .5 mflow Vej² = = .5 * 4.5e-18 * 1e24 = 2.25 e6 = 2.25MW hence the 6 orders of magnitude boast (more like 5 actually with those numbers) when comparing to 20W power. So @frobnicat used 1Gev/cm^3 which is 78680 times less than this estimate ! That would make for the 4 order of magnitude in the best case (near 100% conversion of DM mass_energy flowing through the device to collimated relativistic light particles jet). Note that those quoted equations, which are for a different use of the dark flow (harvesting incoming mass and using onboard power to propel on it, no rest mass energy conversion, incoming mass used "as is") are wrong since Newtonian and giving Vej > c. It should be properly handled in SR, but it does show that this other use (powered propeller in a medium) needs relativistic Vej, and that means that it puts much more energy on kinetic ejection velocity than it gains from recovering the incoming rest mass. Therefore it is sub-optimal when compared to the best case and not indicative for an upper bound. Alright then, but remember the conditions : near 100% DM harvesting and DM rest mass -> energy -> collimated relativistic jet. That is, without involving exotica, as the whole point was to explain the results in a classical framework, even if using still experimentally elusive dark particles. But from a short glance at the paper linked by Aero "Constraints on Dark Matter in the Solar System where this number comes from : those are upper bounds of density as for the measurable gravity effects of DM in solar system's body orbits. While this is interesting as a very clear and strong limit, it implies that (if DM were to be actually found at such upper density limits) DM would stick around the massive bodies => flow speeds < sun escape velocity that's ~40km/s at earth distance (+ or - earth orbital velocity). So this has to be taken into account in the mass flow : take away almost an order of magnitude. So we are about 10000 above my less optimistic numbers when taking a galactic average DM density around there. I think this pretty much discards "naturally occurring DM background in a classical framework" hypothesis as an explanation to even the lower thrust/power positive results. Sorry about that, I was thinking of Fig. 26, the next generation, where the field intensity is maximized at the dielectric surface. If the dielectric is a lot thicker in the tested cavity the intensity could maximize within the dielectric for the lower frequency mode. I wish they would have shown more diagrams, I don't have access to COMSOL. Having said that, my Mathematica analysis of the coupled nonlinear differential equations of the inverted pendulum is showing that the NASA Eagleworks results may be due to real thrust. Why? If ya don't mind? In plain French, Spanish, or Italian. Your choice. Hey: Did you just hit the "quote" button by accident? 'Cause there was not an actual response from you. Well, it gets pretty close, and it is standard physics as discussed at all major academic institutions. And it does not violate local conservation of momentum. 2) Calculations on dark matter get close based on most optimistic assumptions. 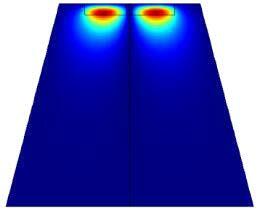 3) Coupling of magnetic damping with power cable and with dielectric may produce measured results. Is it possible that in such a material there is some rectifier effect (forward/backward currents asymmetry) that converts a fraction of the RF AC current (0 net force in a constant B field) to DC current (not 0 net force in constant B field) ? That could explain why there is something more exciting the system when there is the dielectric and not without. Assuming there is current at all... I understand there is current to bounce an EM wave off a conductive wall (the current is induced, conductivity insures E field is 0 at the boundary, ideal case) but what is going on at the boundary of dielectric resonator cavity ? Surely some charges are moving... any non symmetrical non linearities around 0 E field would be very suspect. Also (too lazy to search) it was made mention to AC (Woodward ?) vs DC (White ?) : was it continuous microwave for the later (that is, not DC strictly speaking) and (amplitude ?) modulated microwave for the former ? Can't do better job at explaining with words analysis of coupled nonlinear differential equations with assumed parameters. Will see if I have a better way to explain it.